(Grand Prairie, TX – July 20, 2015) BIG Larry™ is here and ready to light the room. 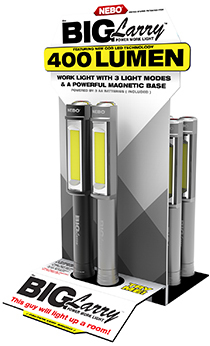 BIG Larry is the latest in the evolution of NEBO’s famous line of pocket work lights under the Larry brand. BIG Larry is more bigger and powerful than any other! BIG Larry outputs 400 lumens of intense light. Secondary light modes include Low (160 lumens) and the Emergency Red Flash mode. This powerful red light is perfect for distress signaling or roadside emergencies. An anodized aluminum body and recessed LED housing ensures that BIG Larry can handle any situation. BIG Larry is available in Silver or Black. BIG Larry is powered by 3 AA batteries (included) and is water and impact-resistant. A powerful magnetic base allows users to secure it to any metallic surface. BIG Larry begins shipping in July 2015 in a 14 piece case pack. A countertop display is included along with individual gift boxes. BIG Larry (#6306) MSRP is $24.95. For ordering or additional information, visit www.nebotools.com or call 800-255-6061.